Once foreign currency purchases and sales, or inventories, fixed assets and other non-monetary items obtained through foreign currency transactions have been translated and recorded, any subsequent changes in the exchange rate will not affect those recorded amounts. This is where currencies are established and configured, and where current and monthly exchange rates are set up. 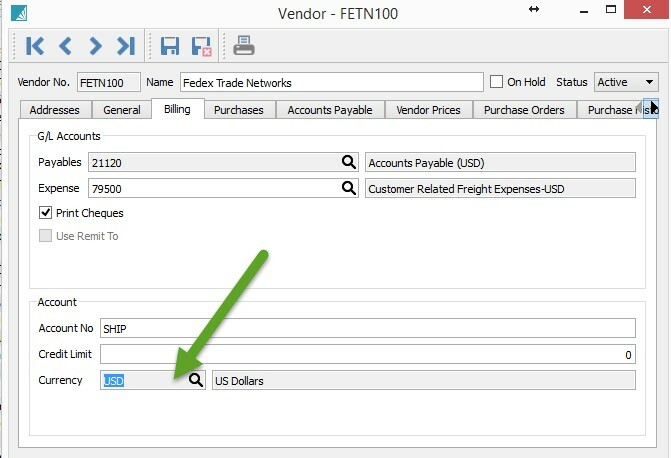 These default to Canadian when first set up, but can be changed to one of the currencies established in Edit / Currencies. 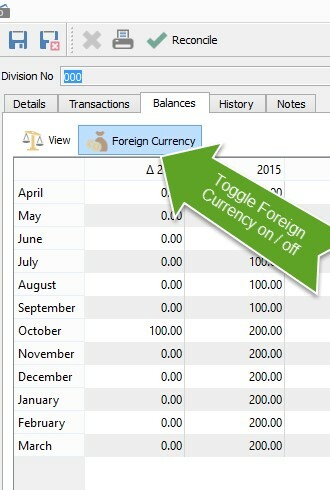 The foreign denominated General Ledger accounts, Accounts Receivable and Accounts Payable are all maintained in the foreign currency as well as Canadian dollars; for every foreign currency entry, there is both a Canadian dollar journal entry as well as a foreign currency journal entry. The important balance is the foreign currency balance for accounts denominated in a foreign currency since it is derived from the actual transactions such as sales, cash receipts, purchases and payments. The Canadian balance is merely the calculated equivalent. For current transactions, the system uses the current exchange rate to record the Canadian equivalent; for transactions in a prior period, the system uses the rate for that period. 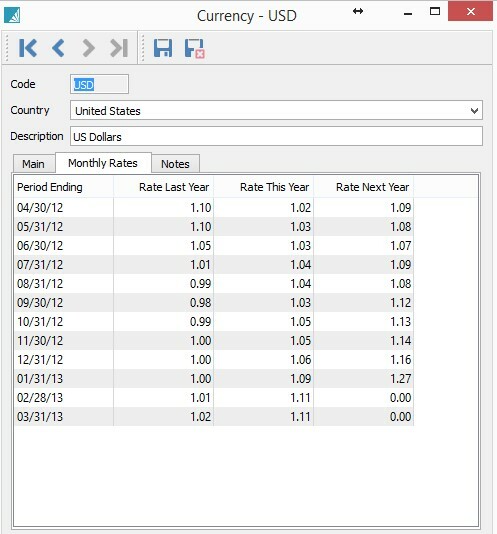 If a rate has not been entered, it uses the current rate. Users can also set the exchange rate for specific transactions. The revaluation routine only affects those accounts flagged as ‘Revalue’. 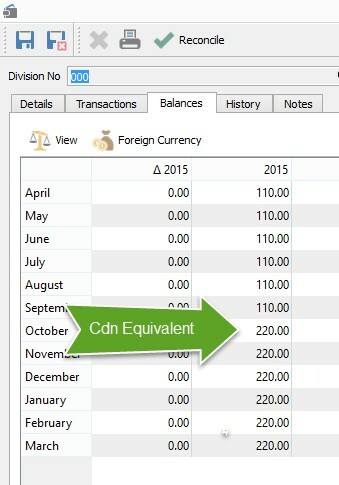 The revaluation routine calculates the Canadian dollar equivalent of any foreign balances flagged as ‘Revalue’ using the exchange rate set for the period end date, and then it compares it to the Canadian amount previously calculated. The difference results in an unrealized foreign currency gain or loss; the other side of the journal entry is to the asset account. 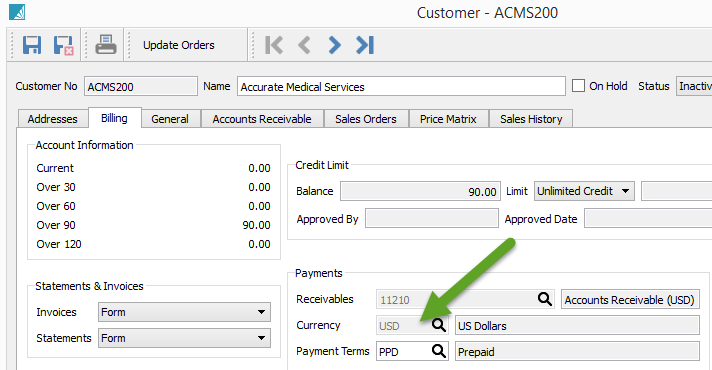 To run the revaluation routine, click on the Revalue icon when on the Accounts tab of the General Ledger. You can revalue individual accounts or all accounts at once; you can revalue for the current date or for any date in the past. Most companies would typically revalue once a month at month end. Print the Aged Listing for the month end date. The US and other currencies will have their own sub-totals. 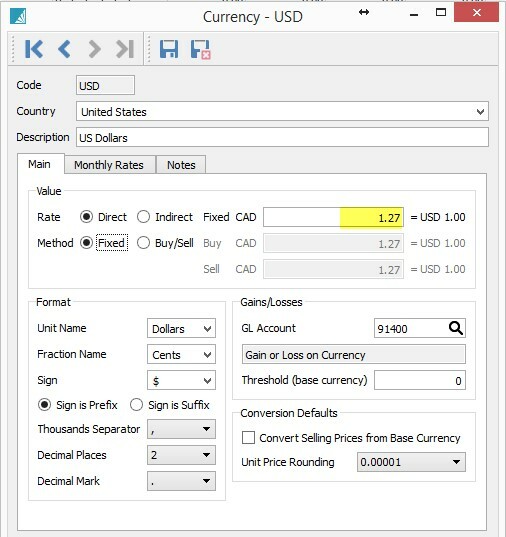 This document provides a high level view as to the structure of foreign currency transactions in Spire. Please do not hesitate to contact me for further guidance regarding foreign currency in Spire at rita.bloem@rogers.com.